London, January 24, 2015 — LazyCoins demoed their killer Bitcoin app LazyPay at the BitcoinExpo 2015 in London last weekend. The company has spent months carefully and quietly planning to take the app public. Including running the payment and merchant services app through testing with a security firm. And holding Q&As in order to perfect their software and get everything right before debuting to the world. Daychopan began his talk at the conference on the importance of security. He stressed this is the number one focus for both their exchange and their merchant services app, to guarantee “rock solid security” for their users. LazyCoins announced the beta version of their new exchange six months ago in July, but they chose not to go public right away in order to learn from and avoid the mistakes of other exchanges. They launch in direct competition with similar-service industry leaders BitPay and Coinbase. The goal with the LazyPay app is to make Bitcoin use a part of everyday life, increasing its volume of use in the in-person merchant market, getting more people to use digital currencies as a form of payment, rather than just as a speculative investment tool. The average person needs to be able to find more places to spend bitcoin, they don’t know how to obtain it, and transactions seem too complex. Lack of education among retailers and the lack of an easy-to-use, trusted merchant platform are also problems. LazyCoins and LazyPay are designed to fix such issues, with security at the top of their priorities. Cold storage wallets and two-factor authentication for accounts, fingerprint access for the app, and multi signature keys are just some of the many features. And a policy of crediting a merchant account on the day of their transactions, by the exact amount that the user pays, will eliminate the risk of price fluctuations. They are on a mission to sign up merchants and educate them on the benefits and ease of accepting Bitcoin. The app is free, offers zero-transaction fees, daily direct payments to bank accounts and no chargebacks. 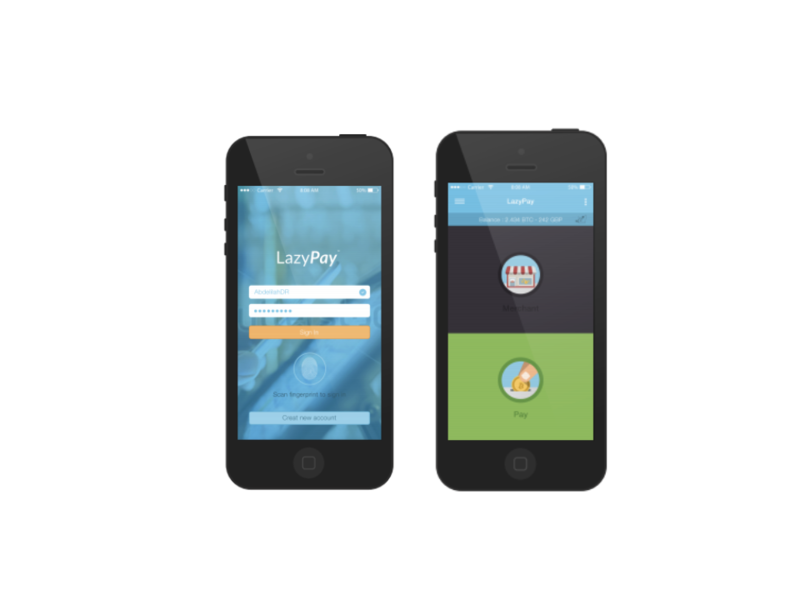 LazyPay will demonstrate how credits cards are slower, riskier and more expensive in comparison. Operating the app will be intuitive for the non-tech person; easier than using a cash register or credit card point-of-sale terminal. On top of all these features, the app will include a live, automatically updated map showing the locations of local Bitcoin merchants and businesses. It will offer NFC-enabled payments for super fast POS transactions, the ability to buy and sell bitcoin from the app and a direct in-app link to bank accounts. And the merchant will require no hardware and not be asked to sign contracts or make any commitments.